I’m not usually a fan of so-called movie franchises, which invariably dip in quality the longer they are extended, but I’m very partial to the Apes series, the third episode of which has just landed in Durban. It’s a sobering experience to view the frequently monstrous behaviour of human beings through the eyes of apes that are being oppressed by them, giving rise to gloomy thoughts about humanity being the greatest threat to the continued existence of this planet. Brilliantly co-written and directed by Matt Reeves, War for the Planet of the Apes is an intense, exciting adventure story (in 3D) that has been wonderfully photographed. The somewhat world-weary leader of the apes, Caesar, is a miraculous contrivance, created in motion-capture by Andy Serkis (who played Gollum in the Lord of the Rings series). Virtually from the first shot, the audience is solidly on the side of the apes as they seek to evade the human onslaught. What is particularly impressive about the movie – even more so than in the first two editions – is the degree of confidence it has in its created world. The ape characters are utterly plausible and sympathetic and audiences will have no difficulty in identifying with the movie’s simian characters who are at the centre of the narrative. This epic 148-minute picture opens with the apes and humans at war. After a brief battle in a forest, Caesar sends some human captives back to their leader (a Colonel Kurtz-like character straight out of Heart of Darkness played with nasty relish by Woody Harrelson) with a message of peace. Not surprisingly it is ignored, and the battle continues. After a sneak attack on the apes’ compound next to a spectacular waterfall, a devastated Caesar embarks with some of his comrades on a rescue and revenge mission directed at the Colonel’s heavily fortified POW camp. It would have been easy for Reeves to use crass metaphor to make easy points about the state of the world today, but fortunately he largely resists this temptation. Instead we get an almost old-fashioned adventure story with some tremendous action sequences, leavened by occasional sprinklings of humour. 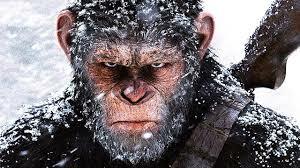 The movie’s technical achievements are remarkable with the band of apes, chimps and orangutans convincingly presented. Communication between the characters is sometimes in English and sometimes in grunts (with subtitles explaining what is said). All of it seems completely natural and unforced. Reeves has hinted at another episode, but it would not be giving away too much to say that this third episode provides us with an emotionally satisfying conclusion to what has been a marvellous tale.